Mike Lamb is This Year's Ray King ~ The Bucky Channel - The World of Sports from Wisconsin's Perspective. Last year, the Brewers acquired Ray King in September as a veteran to help them in their quest for the playoffs. Since he was added to the roster in September, he wouldn't have been able to join the team for the playoffs. This year, the Brewers have another another veteran for the playoff push in Mike Lamb. Lamb was recently released by the Twins after struggling for much of the season. He'll give the Brewers another option at the hot corner along with Counsell and Hall. As Tom Haudricourt speculates, this likely means that Russell Branyan probably won't return this season, and the Brewers aren't confident enough to give Mat Gamel extensive time at 3rd base. However, Joe Dillon and Vinny Rottino could also get time at 3rd down the stretch. 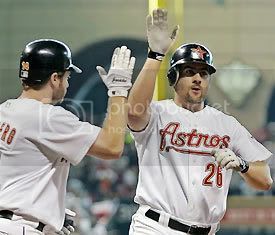 I've never really liked Mike Lamb, because I hated that entire Astros team when they made it to the NLCS. Then again, I've never really like Ray Durham, but learned to accept him when he donned the blue and barley. Lamb will wear number 47. To make room for him on the 40 man roster, the Brewers DFA'd catcher Lou Palmisano.